Two weeks ago Maccaferri de México S.A. de C.V. participated in the NAFTA MARKETING MEETING at the offices in Maccaferri US located in Williamsport, MD. NAFTA Marketing Meeting – Global Capability with Local Presence. The Marketing Managers for the countries of Canada, Mexico and the USA recently met at the Maccaferri Inc. headquarters in Williamsport Maryland. 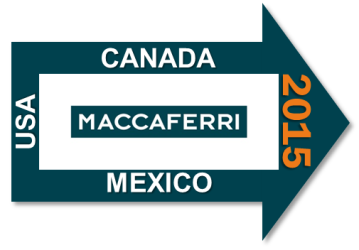 The Maccaferri NAFTA meeting wa joined by Matt Showan, the International Marketing Manager. The three day meeting was designed to enable the collaboration between the countries should increase dramatically. Teaming together can lead to increased productivity, cost savings and brainstorming of new methods of marketing Maccaferri. The first day of the meeting each marketing manager presented the annual plan of their respective country, where the current status of each Maccaferri was reported; then the international marketing manager presented all the updates provided by headquarters, where he emphasized the digital strategy for next year, feedback and ideas from arround Maccaferri world. Highlights from the meeting included, Roxana Lugo, the Marketing Manager for Maccaferri Mexico, presenting a video that was produced in her office. It was well received and the other managers then discussed possibly doing one of their own. Furthermore our use of Customer Satisfaction surveys to drive performance change was discussed. the The opportunities for the region in terms of Rockfall mitigation, geosynthetics and gabion products were emphasised by Maccaferri de Mexico. Michael Slater, from Maccaferri Canada provided information about the operations in that country and insight into how their sales/technical support teams works so well together. The host office of Maccaferri USA, led by Craig Foster, showed his information and introduced Integrated Marketing Campaigns to the group. By the end of the meeting, plans for a 2016 meeting were already being discussed. For more informations about Maccaferri activities contact us.